The heavy duty axial fan kit is designed for custom projects and as a replacement fan. The high speed 120 by 120 by 38 millimeter 115V AC axial fan is housed in die cast aluminum with thermoplastic blades. Containing long life dual ball bearings, the fan can run continuously for 67,000 hours and be mounted in any direction. Has terminal connectors but can be converted to AC wire-leads with the included power cord adapter. Does not include fan guards or plug cord, please see model HS1238A-X. AC Infinity fans are certified by CE, UL, TUV, and RoHS. The fan's housing is constructed of die-cast aluminum painted black and able to perform well in harsh environments and withstand shocks. Its impeller and blades are molded with thermoplastic and meets UL 94 standards for resistance to flammability. Impedance protected motors contains windings that have a higher resistance to heat during a rotor lock. This high speed fan is suitable in applications where maximizing airflow is the primary objective and a louder noise level is tolerable. Popular uses include tanning beds, LED signs, server racks, industrial machinery, arcade systems, and more. 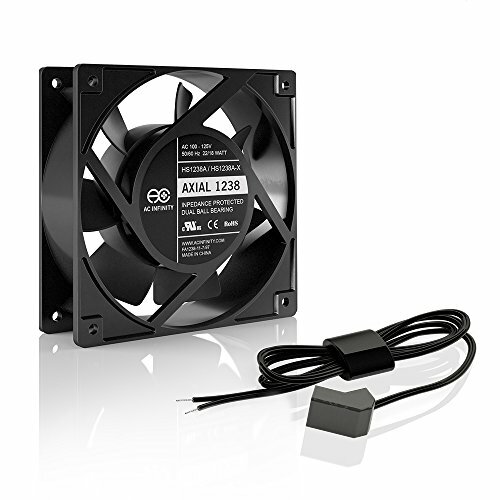 Because this is a standard industrial size fan, it can be used to replace fans found in various Samsung and Eaton servers and UPS systems. Designed for projects that requires cooling or ventilation; or as a replacement fan for various products. Terminal connectors, includes optional wire-leads cord adapter. For same kit with plug cord and grilles, see model HS1238A-X. High Speed: This model is designed to maximize airflow and can be too loud for some applications.